It's Saturday night, you've planned to grill burgers but suddenly the sky lets loose, rain, thunder and lightening... and ruins your plans. You can still grill... kind of. I originally posted this style of 'indoor' grilling back in the Spring of 2009. I lived in the Northern part of the country then and it was in the 40's that evening and although I wanted to grill burgers, I didn't feel like standing out there and doing so, so I came up with an idea to 'grill' them inside. For this burger, use your own favorite recipe if you wish - or just use ground beef or turkey, a little salt and pepper and call it good. You don't have to 'add' things to make a good burger but you can if you wish! Sometimes I add wheat germ and an egg to ours. Other times I add a bouillon cube. Eh, whatever I feel like at the time. Here is one yummy idea for you... but the real fun part is using a cookie cooling rack and a baking pan as your 'grill' and enjoying a < *cough cough* > grilled burger even if it's freezing cold or storming outside. Drop the bouillon cube in the water and microwave to dissolve. Then mix everything together with your hands and form patties. I got about 8 large patties from this. Here is where the 'grilled' in the oven part comes in; Place the patties on a wire cookie rack and place the racks on cookie sheets with 1/2" sides to catch the grease. Bake at 400 degree's until just done and then placed them under the broiler. Broil about 3-4 minutes to give them nice dark color and sear them a bit. Immediately remove, top with cheese and place on toasted buns for the heat to melt the cheese. Serve with your favorite condiments; ketchup, mustard, lettuce, onions, tomatoes and whatever else you love! *Options: Above I mentioned some options to add to your burger mixture if you wish. From BBQ sauce or Worcestershire Sauce to hot sauce. Also consider; wheat germ, flax meal, crushed crackers or flour if you need it to a 'little' bit further. Some fun additions include cheddar cheese, jalapeno's, bits of bacon and of course all sorts of spices like garlic salt, onion powder, garlic powder, Lawry's salt or oregano. Remember to add SMALL amounts to start your 'trials' as you can always add more... but you can never take it back out! I'm smiling as I put up this post this morning... and I'd like to share why. I did a search of my site for our favorite bbq (pulled pork) recipe and I see I posted it once in 2007. The blog entry talked about one of the things I missed about the South - good ol' Southern BBQ. Well, in March of 2007 we lived in the frigid North where winters are 7 months long. Since then, we have indeed been relocated 'back' to the deep South and I'm currently living in an area of the USA where I could probably find good bbq at least every mile if I tried! So with a smile on my face I'm reposting this from 2007. It's still a recipe I am making and love. It's also a great idea for any backyard bbq you might be planning for the Fourth of July holiday coming up! (PLAY with your food; meaning - play with this recipe. To save time I often just throw all the ingredients in and cook it in the crock pot all day if I don't want to have to think about it). One of the many things I miss about living in the South is the ability to get some good old fashioned Southern BBQ. How you make BBQ differs in the region of the country you live in, but it even differs state to state and sometimes even city to city. Up North where we currently live they don't seem to think bbq is bbq without a tomato product in it. I love a sweet sticky BBQ rib as much as the next person but I do love my 'pulled pork' bbq that is made with nary a tomato product in it. Reminds me of when we lived in Tennessee and the best BBQ you could find would be in a beat up old shack of a restaurant on the side of the road in a tiny little 900 person town. This is my own recipe, made up a few years ago when we lived in Minnesota and I was craving it. We are having it tonight so I quickly snapped a picture for the recipe blog. Cook in a slow cooker or crock pot all day with just salt and pepper seasoned until it's done and so tender you can shred it with 2 large forks. Before shredding drain off most of the liquid but reserve it. Add to the shredded meat. Add in about a cup of the reserved liquid from cooking. At this point you can let the whole thing cool down and refrigerate over night or even package it up and put it in the freezer for a later date. The setting time allows the flavor to really set in and it's amazing. However you can serve it right away. I would try to let it cook in the slow cooker for at least an hour or two before serving if I had the chance, but you don' t have to. Serve on soft buns or rolls with condiments such as dill pickles and mustard with some cole slaw on the side and big glass of sweet tea! Although I have posted this recipe before, the photo above is 'dinner' for myself and my 17 year old daughter recently. Sometimes we just crave one of these "Bloomin' Onion" appetizers for dinner and if my husband is working and we don't have to worry about making anything for anyone else but just us, we often have an 'appetizer' dinner. This is one of our top 5 choices. The first thing to mention is to make your sauce first. That spicy Southwestern sauce is so good and is the perfect accompaniment to the hot, fried onion petals. But it's better if it can chill for a couple hours if you have the time so the flavors all blend together. The second thing to mention: I do own an 'onion' cutter guide. It's a cheap little $5 plastic cutting guide I bought from Amazon years ago. It's flimsy, it didn't come with any instructions and it didn't have a 'corer' (which they apparently sell with them now) but I like it! People may complain about they are just cheap plastic, but they DO work and they DO help you slice. You put your onion in the center and simply use the prongs as guides to slice the petals and it keeps you from cutting all the way through the onion and accidentally cutting it in half. *But you don't need one to make a Bloomin' Onion* For a short time, it was 'lost in the move' from our recent relocation so the photos below show you how to cut the onion if you don't have a slicing guide. You just have to be careful not to slice down so far the onion breaks apart. The onion in the picture above is the one we had recently and I did use the guide I bought on Amazon. (Links to a few options are at the end of this post). Beat the egg and combine it with the milk in a medium bowl big enough to hold the onion. In a separate bowl, combine the flour, salt, peppers, oregano and thyme. I've posted both these recipes in past years, but I've never put both of them in the same post even though they are for two versions of a very similar drink. I rarely drink because I simply don't like the taste of alcohol. 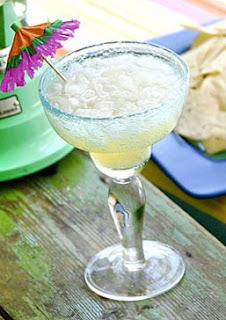 The one drink I will enjoy once in a great while is a frozen margarita. 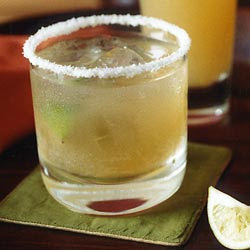 When it comes to Margarita's, you can find a vast array of flavors and a rainbow of colors as it's a fun drink to play with and improvise with fruits and flavors, however, a couple years ago, BEER MARGARITAS became the 'next big thing' in summer backyard bbq's and get-togethers. Here are two versions. The first is a frozen concoction using crushed ice and the second is a quick and easy stir and serve version. Both have gotten rave reviews from readers in years past. Pour the Limeade into a pitcher. Fill the empty can with Tequila and add to the pitcher. Pour in one cold beer. Stir, serve. If you are gearing up for some backyard fun on the Fourth of July, looking for an adult brunch drink for a bridal shower or a night with friends, here are three drink recipes to get you started. Hearing the word "zipcicle" caught my attention so of course I did what almost everyone today does; look it up on the internet! It ends up 'zipcicle' (or as I found out later, the official Zipzicle) is a DIY popcicle like the Flav-or-ite frozen treats I loved as a kid. The long, skinny, plastic frozen ice treat came as a liquid in a package of about 24 and we would watch Mom put them in the freezer and then bother her unmercifully for the next 3 hours wondering if they were finished. Some of my earliest memories are honest-to-God of sitting on our garage step with my baby brother and eating grape flavored ice treats. I even vividly remember the cuts on the sides of my mouth from the plastic edges, because as thin as the treats are, my little two year old mouth was even smaller! This morning I became aware of the official "Zipzicles - The ONLY Zip-Top Ice-Pop Mold! " wrappers that everyone is mentioning when the subject of homemade ice pops come up. Some are Mommies filling them with simple Kool-Aid mixtures, others go for the sugar free Crystal Light versions and still others are enjoying these as 'adult' pops made with vodka, rum and other alcoholic blends. Some of the fresh ideas involve yogurt and fruit mixtures... berrylicious! The down side to the official wrappers that easily "zip" close is you get 12 to a package and you have to hand wash to reuse. I did find a more affordable version on Amazon with 100 bags per package but you do have to seal the tops yourself as they do not have zip-closures. I read the comments and found the ideal was to use a food-saver type sealer but for those that don't have one (I don't) others were using simple twisty ties or rubber bands to seal them until they froze solid. This idea is for those who don't like the idea of throwing plastic wrappers away and want a reusable package that is easy to clean. I found this set also on Amazon - of food safe silicone. Personally, my family has always enjoyed homemade pops using something I've posted about years ago... I have the original Tupperware set of popcicle molds my Mother bought back in 1973. Yes! I know, right!? How awesome is that! I love them and use them to this day... but I do admit I'm thinking of purchasing the Zipzicles as well and I'll fill them with a sugar free grape Kool-Aid mixture. When they are frozen solid I can sit on the front step like I did when I was two years old and maybe I'll even call my baby brother to share the moment. I admit, I get so busy I am usually looking at the present day's 'to do' list the morning of. It's no wonder holidays sneak up on me! If you are planning on decorating or baking for the July 4th holiday... plan now. Either visit your local stores for decor before they are all sold out of red, white and blue, or order online with plenty of time to spare. Here are some quick idea's I found on Amazon that I really loved. The first is CUPCAKES! Who doesn't love cupcakes? Whether you are making a low carb, sugar free cupcake or a full sugar, yummy traditional version, it's the decorating that grabs people's attention. Easy when you start with this affordable option, which includes 100 Patriotic Baking Cups With Picks . Kicking it up a notch, it's only a few dollars more, but this option has a little more flashy liners and 4 eye-catching cupcake picks for easy decorating that makes it look like you took hours. Hosting a back yard event? Decorating is quick and fun when you have bunting, a banner and a table cloth to start you off! And this is the easy (and cheap) decorations my kids always like to 'help' with when they were toddlers; the window clings! Whatever your plans are - just a heads up that if you wait until the weekend before the Fourth of July, most of the red, white and blue paper goods and decorations will be picked over so get to your local stores soon! Actually.... let's do 13 zucchini recipes! I did a simple search of my recipes using zucchini and had so many wonderful choices that I ended up posting 13 instead of 12. We can just call it a 'baker's dozen' of recipes since a baker's dozen is 13 (allowing for one of the bakery items to break, etc) and having a back up. With gardens starting to give us a plentiful harvest of this very versatile, awesome vegetable, here are 13 idea's to use up some of the long, green, yummy squash offerings of the summer.